The Cat in the Hat is a very mischievous and fun-loving cat from another dimension. His companions, Thing One and Thing Two, are as famous as he is. He might be a bit naughty and her certainly loves entertaining kids, but he does have good intentions. The Cat in the Hat is an anthropomorphic black and white cat who wears a red and white-striped tall hat, a red bow, and white gloves. 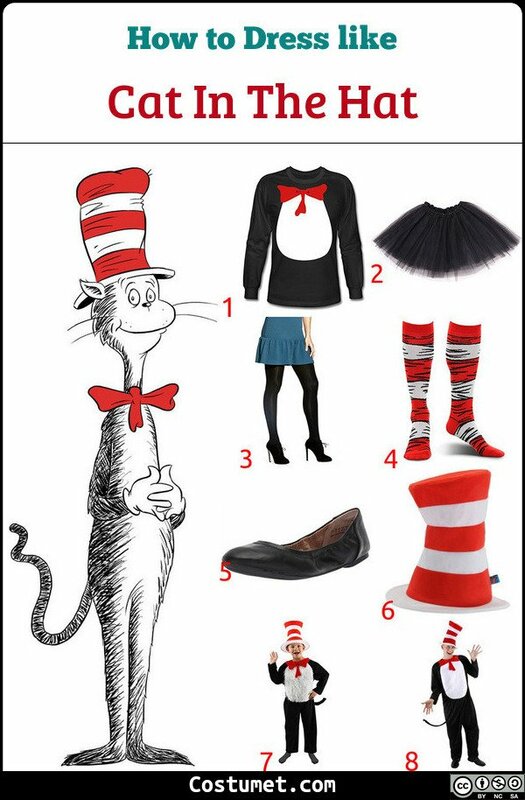 Here’s everything you need to look like the Cat in the Hat. 1 Cat in the Hat Long-Sleeve Shirt Use this Cat in the Hat-themed shirt as part of your costume. 2 Black Tutu A black tutu creates a nice and feminine look to the otherwise gender-neutral Cat. 3 Black Tights To keep the appearance that you’re colored black all over, wear a pair of black tights. 4 Cat in the Hat Socks You can also wear a pair of red and white-striped socks as part of your costume. 5 Black Flats The cat doesn’t wear shoes so black flats will do. 6 Cat in the Hat Hat Of course, you should also wear Cat’s famous hat. 7 Cat in the Hat Kids Costume Set Transform your kid into a fun-loving cat with this costume set. 8 Cat in the Hat Costume Set You can easily become Cat in the Hat with this costume set. 9 Cat in the Hat Plushie Bring along a Cat in the Hat plushie to have a friend you. The Cat in the Hat was portrayed by Mike Myers in the 2003 film of the same name. Myers has played iconic roles throughout the years including Shrek, Austin Powers, and Wayne Campbell. For Percy Jackson costume you will need to wear his orange Camp Half-Blood shirt, denim shorts, brown leather armor, and his camp necklace. George is a little brown monkey that always has a smile on his face. The Man in the Yellow Hat costume has a yellow hat, wears a yellow shirt, yellow pants, a black belt, black boots, as well as a yellow necktie with black polka dots.